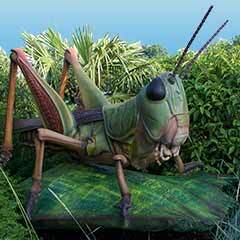 Get ready, Giant BUGS are invading Franklin Park Zoo! Roles will be reversed as you venture through the exhibit and find yourself looking up into the eyes of an 8-foot-tall tarantula, or at the tail of a mighty emperor scorpion looming 15 feet in the air! 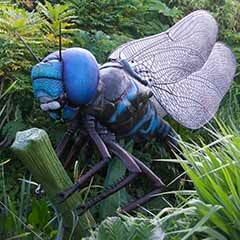 These larger-than-life animatronic insects include the red-tailed bumblebee, Mexican red knee tarantula, Madagascan sunset moth, meadow grasshopper, emperor scorpion, and many others. 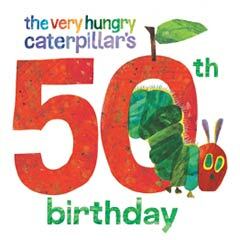 Adventure-seeking kiddos can test their climbing skills on a rope spider web, and insect enthusiasts can bug out at interactive education stations and even meet some real-life insect ambassadors up close during daily encounters, held at 11:30 a.m. and 2:30 p.m.
Don't miss a story walk through the pages of Eric Carle’s classic children’s book, The Very Hungry Caterpillar – celebrating its 50th anniversary this year. More to Bug you with! Put a bug on your mug! Visit our Kids' Corner to print your own ladybug and bee masks!